Design is the choices we make about the world we want to live in...We make our world what it is and we become the kind of people who live in it. Founded in 2008, the Build conference is a five-day design event held in Belfast Ireland, and run by Andy McMillan. The heart of the event lies in the small, focused conference that places an emphasis on community and shared stories. One talk in particular that we often return to is Wilson Miner’s When We Build, from Build 2011. Wilson Miner is the head of design for Rdio, a social music service. 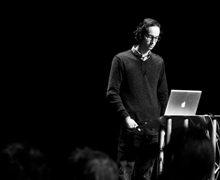 He co-founded the neighborhood news site, EveryBlock, and he was a former interactive designer at Apple, where he worked on the first comprehensive redesign of apple.com in more than 10 years. Throughout his presentation, Wilson reminds us that when we build things, “We’re actually in the process of building an environment where we’ll spend most of our time for the rest of our lives. We’re the designers.” He urges us to adapt, to learn to listen, to be available in response to the changes around us. He asks us to think about what we want to nourish us, and want we want to see grow. When We Build, is one of the most poignant, moving talks on design we’ve seen. It is one that every designer should watch, learn from, and experience a rare sense of emotion about the state of design. The Build team recently made all of the 2011 videos available online and we recommend you spend some time with these speakers and get inspired by their collective knowledge. Glean insight from Josh Brewer, who reminds us to remember that design is about relationships, Craig Mod, who encourages us to nourish our habits to nourish design, and Jason Santa Maria, who empowers us to move beyond the basics of typography.